On Sept. 19, 2017, Mexico City commemorated its 32nd anniversary of rising from the debris left by its worst earthquake in modern history; the capitalinos’ resilience (residents of Mexico City) was tested anew. A 7.1 magnitude earthquake hit the capital of Mexico adding an extra struggle to a country that was recovering from a previous 8.1 magnitude earthquake that took lives and homes of many in the states of Chiapas, Guerrero, Morelos, Puebla, Oaxaca and the State of Mexico, just a couple of weeks before. In response to the disasters, the Mexican federal government decided to treat both regions differently by creating two aid packages. The former Secretary of Treasurey and Public Credit, José Antonio Meade, and the current president of Mexico, Enrique Peña Nieto, confirmed that aid will take the form of special credit lines, and tax extensions for the victims. In short, the capitalinos, who enjoy a high quality of life with access to modern infrastructure, received unconditional cash transfers to be repaid after the reconstruction period. On the other hand, the Secretary of the Agricultural, Land and Urban Development, Rosario Robles, announced that victims of the first earthquake in the region encompassing Chiapas, Guerrero, Morelos, Puebla, Oaxaca, and the State of Mexico were granted subsidized construction material and construction kits. These officials explained that the federal government “will not give money away for the sake of giving.” As such, residents outside of the capital, in the poorest towns and villages of the country, received subsidies for construction materials as opposed to increases in income. Microeconomic theory states that conditional cash transfers make people better off than a subsidy for specific goods even if both are worth the same money. The phenomena is called “The Lump Sum Principle” and it is that “an income tax or subsidy leaves the individual free to decide how to allocate whatever final income he or she has [while] taxes or subsidies on specific goods both change a person’s purchasing power and distort his or her choices” (Nicholson & Snyder, 2005). In other words, the Lump Sum principle argues that individuals will better allocate their income, reaching a higher level of comfort than having somebody direct that allocation on their behalf. 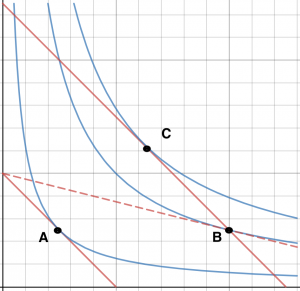 To further illustrate this principle and how it is connected to the aid packages granted by the Mexican federal government, the graph below is a mathematical representation of the Lump-Sum principle. 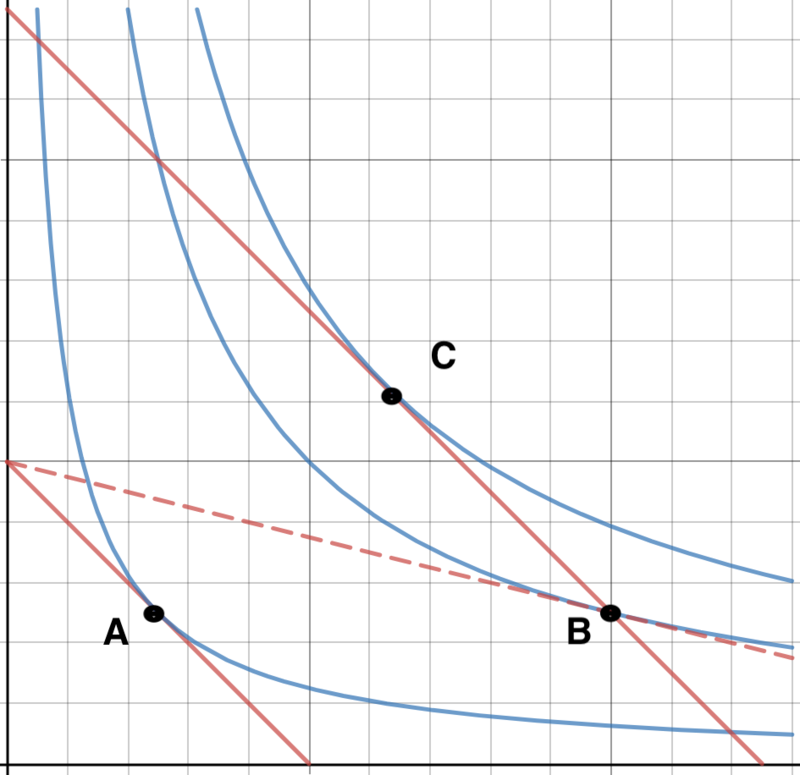 In this hypothetical example, the three red down-slopping straight lines (including the dashed line) represent the purchasing power of those receiving the aid packages, while the three blue convex lines are the different utility (comfort) curves: The further away from the origin, the higher the income and utility, respectively. Points A, B and C represent how the different aid packages affect their recipients, respectively. For the sake of the argument, assume that both aid packages are equal in value and that both the capitalinos and those out of the capital are at point A following the earthquakes with equal income and utility. We can say that point A represents a situation where no aid packages were given, while points B and C represent situations where aid was distributed according to the conditional cash transfer and unconditional cash transfer, respectively. Those out of the city receive conditional money transfers. Thus, the aid package will increase their purchasing power from the red line closest to the origin to the dashed line, allowing them to reach a higher level of utility on the blue line: Point B. Notice how the red line becomes flatter modeling an increase in purchasing power of just one good measured by the horizontal axis (i.e., construction material). The capitalinos receive unconditional money transfers. Thus, the aid package will increase their purchasing power from the red line closest to the origin to the red line farthest from the origin, allowing them to reach a higher level of utility on the red line: Point C. Notice how the red line moves away from the origin keeping the same slope, modeling an increase in purchasing power of all goods measured by the horizontal and vertical axes. The two grants are worth the same amount of money, illustrated by the fact that both purchasing power lines go through point B. The capitalinos and those out of the city are both better off than with no aid package; however, since point C (where the capitalinos are located) is on an indifference curve which is higher than the one where point B is (where those out of the city are located), the capitalinos reach a higher utility level than those out of the city. This paper makes several simplifying assumptions that are unrealistic; for instance, the capitalinos and those out of the city do not start at the same level of utility. Furthermore, both groups could find different means (such as skills) to improve their situations or make better use of the aid packages, so their utilities could either diverge or converge. A final caveat of this analysis is that the capitalinos need to repay the money lent by the government. But notice that the analysis is focused on the reconstruction period in which having access to unconditional rather than conditional cash transfers can potentially affect the reconstruction efforts. These are valid assumptions that must be accounted for. Nevertheless, the argument of this paper is not whether the capitalinos are better (or worse) at rebuilding their houses given their current situation. This paper assesses the effectiveness of the earthquake relief packages. Hence, as it is common in economic analyses, assumptions must be made to focalize the assessment. In other words, this paper looks at the relative effectiveness of one Mexican peso spent on direct cash aid to the capitalinos as opposed to one Mexican peso spent subsidizing construction as aid to those out of the city. Therefore, it can be argued that the method used by the Mexican federal government to allocate relief money may limit residents outside of the capital in making the best decisions for their homes. These residents must wait to see what they are provided before they can begin using the assistance to repair or reconstruct their properties. In comparison, the capitalinos enjoy more choices for using the aid, including, but not limited to, housing reconstruction. Nicholson, W., and Snyder C. (2005) (10th edition). Microeconomic Theory: Basic Principles and Extensions. Mason, OH: Cengage Learning. Peña, E. N. (September 27th, 2017). Advancements of actions to the reconstruction and attention to the victims. Presidencia de la República, Blog. Retrieve on September 30th, 2017 from: https://www.gob.mx/presidencia/articulos/avances-de-las-acciones-para-la-reconstruccion-y-la-atencion-a-la-poblacion-damnificada-tras-sismos. Noé J Nava is a graduate student of applied economics at the University of Illinois. Noé does research in the areas of development economics, environmental and resource economics, and labor economics: market accessibility; food security; land, forest and water management; farm workers and migration; and issues of inequality. Quantitative Methods: Input-output, spatial econometrics, panel data and other techniques for policy impact evaluation.